Are you looking to rent out your Ottawa condo, but don’t know where to start? Heard too many horror stories about bad tenants? We have put together a short guide to help guide you with the leasing process and what to expect. Gather all of the information that you can. Ask your condo board about the rules or restrictions on rentals. Some buildings in Ottawa have minimum lease length of three or six months (to stop short term leasing), and some have rules stating that all tenants must be from the same family (to avoid student or rooming homes). What utilities or services are included in the rent or in the condo fee? What about pet’s? Etc. The more information that you can find out, the easier it will be down the line. How much are you going to price the condo for? What are rentals going for in your building or area? How do they compare to your unit? What is the market like and can you take advantage of that? Are you looking to rent the unit furnished? We have seen prices jump around $200 per month this year depending on the building and location, due to a lack of inventory. Before we can get tenants into the property we need marketing materials (pretty pictures) that help gather interest. Is the unit vacant or do you still have your furniture in the unit? If you are still there, do you need to declutter and do any repairs or remove furniture? We almost need to treat it like you are selling. Remember we are trying to find a tenant who is going to love the place as much as you do and one who is willing to pay top dollar for that space. Once everything is perfect we bring in our professional photographer to capture the unit. While you might think it is easy to rent with basic phone quality shots, or even no photos (depending on how hot the market is), having back up photos when the place looked perfect is invaluable. The tenants might not leave it the cleanest and to have the photos ahead of time is only going to save you in the long run! Same as when you are selling, you want to get the maximum exposure that is possible. Industry websites like Realtor.ca are mandatory, but still important are Kijiji, Craigslist, Padmapper, Zumper, along with the more local sites! Are you targeting a specific tenant, such as a student (Ottawa or Carleton University), or diplomat or even specific embassy, political member or specific party, high tech crowd? Depending on the tenant there are specific websites that would be a better target for that tenant. To advertise to Carleton University students, we use Places4Students.com as it is the preferred vendor by the school. Once the property ad goes live, you will start to get inquiries from interested tenants. Often they want some clarification about the ad (is “X” allowed, or is “Y” included in the rent?). Use these questions to help improve the ad if you are not getting the responses that you are expecting. The majority of the inquires will want to book a showing to see the unit. In a hot market, you can schedule a few times that work best for you. Make sure that when you are booking a showing you get some basic information about the person and what they are expecting (when do they want to start etc) so you are not wasting your time if that isn’t possible. Qualifying them as best as possible. Once you have started getting tenants interested in applying, then you really need to put on your detective hat. We have all prospective tenants fill out a full rental application, which lists current and previous job and housing situations. It asks for references, about pets, expected start date, car information, and debts. We will also ask for proof of employment (such as pay stubs or letter of employment), plus we will pull there credit report (equifax etc) so we can see first hand their credit score and how they have managed their finances. We are trying to paint a picture of who the tenant is, and how reliable they will be. Once you have collected all of this, then call the references and employer and verify things that are on the application. You want to ensure they have not lied! Be careful when calling current landlords, often they will say amazing things about the tenant in order to get them out - helping problem tenants find a new place to call home! When speaking to landlords, ask facts, such as did they pay rent on time, etc. Once you have selected a tenant, you will need to have them sign the lease! The government has made this much easier with introducing the mandatory residential lease. It is quite easy to fill out, but take your time and ensure you fully understand each part of the lease. Just because you can cross something out or add a special clause does not mean it is legal or enforceable. You can always speak with your lawyer to help with any additional clauses or questions! Don’t forget to change your insurance to landlord insurance! Plus make sure your tenants have property and liability insurance as well! Often utility companies have Landlord accounts, so any days in between tenants are properly charged to you. Be upfront with your tenants. We prefer open dialogue and good communication with our tenants. If you don’t want pets, make it clear in the add and tell those who apply. Learn the rules, and don’t be afraid to ask questions if you are unsure. It’s a business - so treat it like one. Keep a record of all of your expenses. Speak with an accountant. You can’t write off your time! Explore the benefits of hiring a property manager. A great property manager is worth their weight in gold. Questions about renting out your condo? Want help and guidance? Let’s chat! Buying For An AirBnb Investment in Ottawa? Should I Sell My Condo With A Tenant? Over the last few years, short-term rental site Airbnb has become a go-to solution for those looking to rent and rent out their homes and condos to tourists and business travellers when visiting Ottawa. It provides a cheaper solution to the tenant, and an increased return for the investor. Wait.... not just an increased return, but double or almost triple the return. More and more people are asking about buying a property for Airbnb especially after looking at the numbers. Roughly - One Bedrooms rent out for $1,400 per month vs $120 per night on Airbnb. BUT WAIT. As this trend grew, more issues have started to arise and everyone caught on. Bad tenants, scams, and insurance companies were/are just the beginning. The number one issue today is the condo board and by-laws being put in place to restrict rentals that are less than six months in length. This is a building-by-building issue however, the majority of condo buildings across the city have now placed a restriction in the rules. There are still buildings that still allow short-term rentals in Ottawa but buying a unit within a condo building now is a much larger gamble as each day passes and more rules are added. If not a condo, then what? The shift we are seeing now is away from the high-rise single condo unit and towards multi-unit buildings or single family homes and being converted to these almost rooming house style. The key for a successful AirBNB listing is mainly location (other than price etc), and the best locations typically have a higher purchase price, and to make these numbers work and cash flow, these investors are having to create their own product to fit the bill. By starting with a single family residence, you don't have the condo board setting the rules. The city is strict with rooming houses, so don't think you can just have 10 rentals in a single home. If you plan on having a home with four rooming units or more - then you will require a city license (and follow the permit requirements) - click here. There are a large number of places that could be a perfect fit, but these short-term rentals now come at a higher cost to the investor - they are not an easy money solution anymore. They require extra work and extra investment up front. If you are considering entering the short-term rental market and would like to chat, get in touch. Maybe there is another real estate product that would better fit your needs. This is a pretty common scenario that I am seeing right now here in Ottawa. An owner wants to sell their condo, but has a tenant inside that has a number of months left on the lease. The owner is trying to figure out the best thing to do. Keep in mind I am going to answer this quite generally - every scenario and property is different (things like how the unit shows, the tenant, list price, area, etc will all come into play). First thing I would ask is - Who is the potential buyer for the condo? Owner, Investor, etc? Most likely it is going to be an owner looking to occupy the unit. Depending on the price/unit, the majority of buyers we are seeing are not investors looking to rent out the unit, but owners looking to move into the unit. That being said, most people are not willing or able to buy a place, pay the mortgage (the costs will not cover the rent) and pay to live somewhere else, until the place is vacant. As a buyer, the risk you are taking with the tenant is quite high (yes, you can vet the tenant and verify everything, but the risk is still there). Why not an investor? Well, there is nothing certain in real estate, so knowing my luck the next buyer will be an investor - BUT generally at these prices, resale units do not cash flow under standard financing terms. I have units that cash flow (after ALL expenses) $600 month, on a $250,000-$260,000 purchase price - so compare to the one beds that list around the same price, you would be loosing money every month. Back to the original question... Put yourself in the shoes of the buyer and ask yourself - Would I rather be provided vacant occupancy on closing, or have to worry about kicking out (or waiting for the lease to end) some tenant? Especially when there are other options to buy that could be currently vacant. Tenant just gave me her 60 day notice to leave! Now what? This is when I get to work - how does it show? If it shows badly would it make sense to wait until they leave, paint, stage, and list it, or sell right now? Is the tenant cooperative? I value communication as one of the most important aspects of my job. Communication with the owner, communication with the other agent, and obviously communication with the tenant. If the tenant is unhappy, they won't give two shits about how the unit looks for a showing, and will ensure that 24 hours notice for every showing. When you are selling with a tenant, you want the tenant to be part of the team and on good terms. Right from the start, we make sure that the interactions with the tenant are positive, honest, and open. We need their help to sell! There is more than two months left, what are my options? If you still have more than two months remaining on the lease, obviously you can still list the unit for sale, but finding an interested buyer will become much harder. Keep in mind there is always negotiations with the tenant. While you can't kick a tenant out during a lease, they are not able to leave early - UNLESS you both agree. What is $1,000, the cost of movers, or sometimes even just a case of beer in the grand scheme of things? While you need to make sure that the timing is right - last thing you want is to let the tenant out of the lease, and then the deal falls apart and you have a vacant unit and no buyer. Sometimes buyers love a certain building and would consider moving to another unit within! 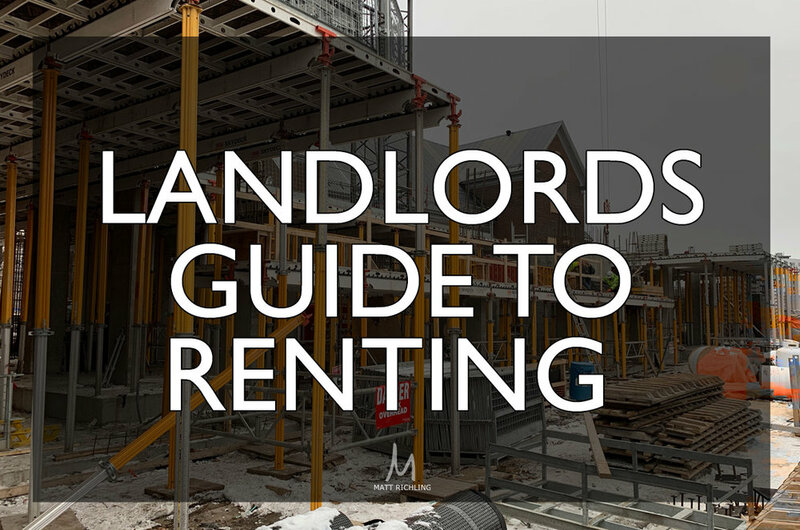 This is all part of that communication with the tenant, and seeing what options you have as the landlord. Thinking of selling your investment condo in Ottawa? I would love to chat more. You can reach me at matt@mattrichling.com or fill out the form below. Is The Fall A Good Time To Sell My Ottawa Condo? Electronic Signatures Starting July 1st!